You're invited to Our Open Studio! For my Portland, Oregon area friends, we are sprucing up the art studio in preparation for an Open Studio Event one week from today. The doors will be open Friday, Saturday, Sunday 10AM-5PM June 9, 10, 11, 2017. Visit my studio where you will see new original artwork, prints, cards and more. Plenty of fun paintings and prints to help you decorate your walls into a beautiful art filled living space. Just the way you like it! Artwork by Blenda, Erica Hanson, and Krista Cary. 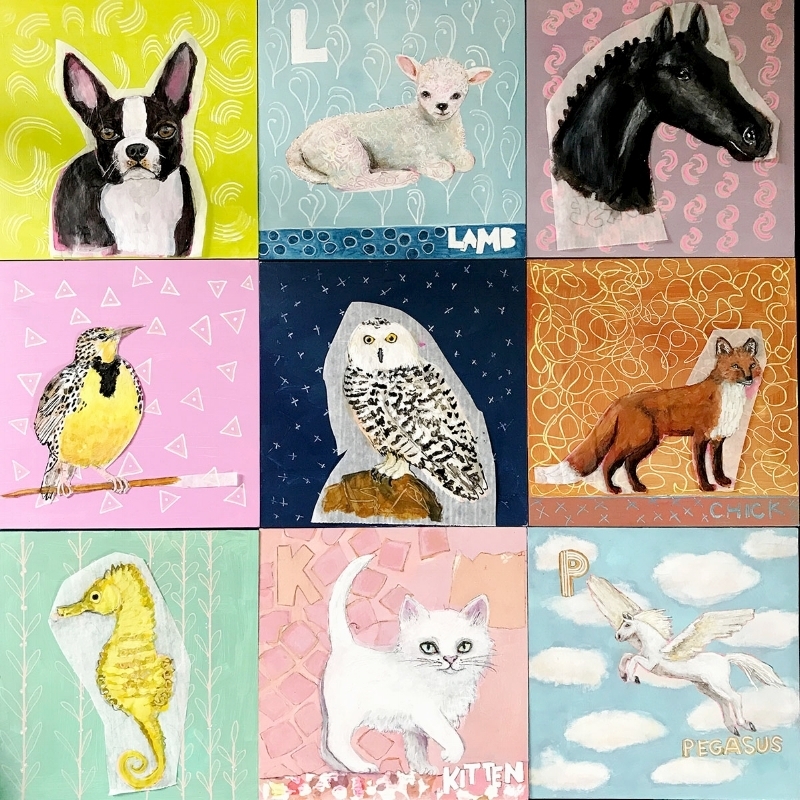 This year's theme features a new series of Animal Paintings. There are 26 paintings, one for each letter of the alphabet. 15% of artwork sales purchased during Open Studio Weekend benefits the Oregon Humane Society. Please help me reach our goal of $500 for this worthy charity that helps animals in need. Update: After the Open Studio Sale: We raised $55 for the Humane Society!! Thank you everyone! In this photo you'll see a work in progress shot. Each background has a pattern of some kind. Some of the patterns have symbols with spiritual meanings incorporated into them. For this series I chose a color palette in fresh trendy and happy hues. While visiting my studio be sure to take a peek at the newly painted office with modern Ikea chair with a faux sheep skin cover. Be sure to stop by the art studio and say hi. Be sure to introduce yourself... Looking forward to seeing you!